Hervey Bay will put you smack in the middle of the Fraser Coast, one of the most people friendly climates in the World and if that's not enough to attract you to Hervey Bay for a holiday; then lets add arguably the best and safest silica sand, north facing beach in the Southern Hemisphere to this idyllic picture and you have a sight to arouse your inner awe, as all your worldly stress wash into this natural Lake like Bay, commonly referred to as the Wide Bay. A Hervey Bay Vacation? 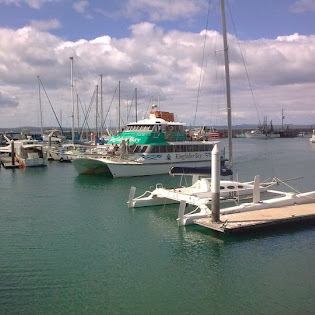 (pronounced Harvey Bay) Where and what is Hervey Bay about you may be tempted to ask? Hervey Bay is a "Best Kept Secret" beach resort city located 3.5 hours north of Brisbane City in the State of Queensland, Australia. Pialba, Scarness, Torquay and Urangan. This familiar bach (World English Dictionary n2 - a simple cottage, especially at the seaside) look of the past, has been changing to accommodate the sophisticated visitors now adding Hervey Bay to their holiday destinations. Set up your own Hervey Bay Holiday check-list and you'll be convinced it has all you'll need to recharge your batteries, whether you're looking for a family focused Hervey Bay Holiday or an X-treme singles getaway, or maybe even a romantic Fraser Island based break. Stay in Hervey Bay and you won't regret it. Smile with the knowledge that your kids can bathe in safety from the day they're born, then you can watch them grow and enjoy activities with an ever expanding degree of difficulty. You never know, they may enjoy the unspoiled environment so much, that they will choose to get married on the white sands of the largest sand island in the World, Fraser Island. They can have their wedding photos taken next to beautiful fresh water lakes, then have their reception at one of the many four and five star resorts. Or you may like to treat your new son or daughter in law to a whale watching honeymoon adventure. Then of course they can start the cycle all over again, and bring their children along for their own Hervey Bay Holiday. The Hervey Bay climate is so mild that numerous retirement villages and resorts have been developed, what better way to relax in your senior years than make your Hervey Bay Holiday <a href="https://www.hervey-bay-holiday.com/realestateenquiry.html">permanent, click here to express an interest in purchasing a slice of heaven in South East Queensland. Hervey Bay has grown phoenix like from these small seaside retreats of yesteryear, as a result of the contemporary desire of Queensland and out of state investors to benefit from the popularity of well placed coastal communities. This development, has turned this town of fewer than 20,000 people into a modern seaside jewel with a population exceeding 60,000. Although property investment may be constrained in the next few years as global economies consolidate, the foundation has been established to ensure further improvement in services and infrastructure has been secured. Development of what will become one of the prettiest and diverse outdoor holiday spots in Australia; Hervey Bay, has begun in earnest. Get your Hervey Bay Holiday Groove on now, book a Whale Watch cruise!